This is the last post for this round of “eat the food already in the house”. In addition to the several posts you’ve seen here, we had quite a few other meals as part of this project. They just were not blog worthy. Left over frozen Turkey noodle soup. Hamburgers (we had two) and Italian sausage burger (1/2 pound) served on hot dog buns with sweet potato fries. The best of the bunch that never made it to the blog was actually quite fun. We had frozen biscuits, chicken nuggets, buffalo wing sauce and slices of muenster cheese. So I put them all together. Made the biscuts, cut them open and put two nuggets on each. Covered them in buffalo sauce and 1/2 slice of cheese and back into the oven for the cheese to melt. Awesome. This is not that recipe, though. I had purchased a squash and zucchini to grill but hadn’t gotten around to it. I had left over grape and cherry tomatoes so I threw this together on the fly. You really can’t go wrong with these fresh ingredients. A little wine and spices too. 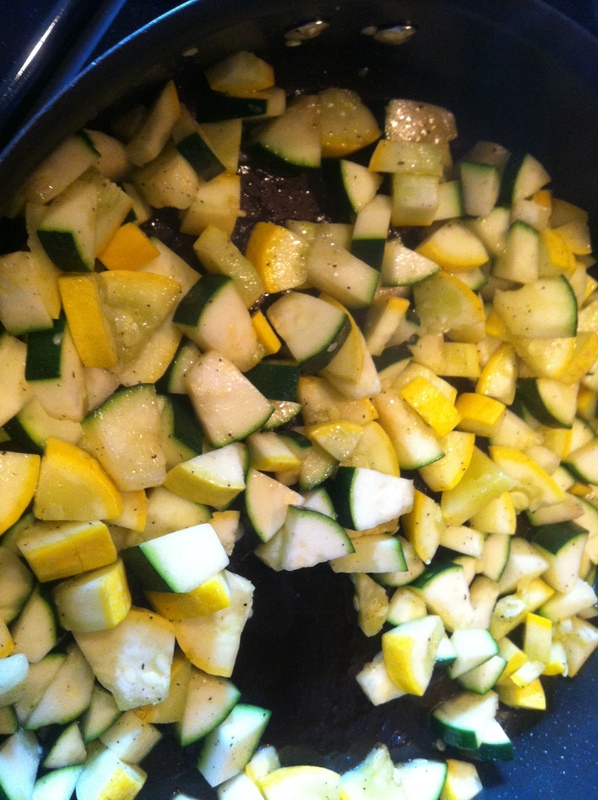 I diced and sautéed the squash and zucchini. The spices and the wine. In a skillet, heat oil over medium heat. 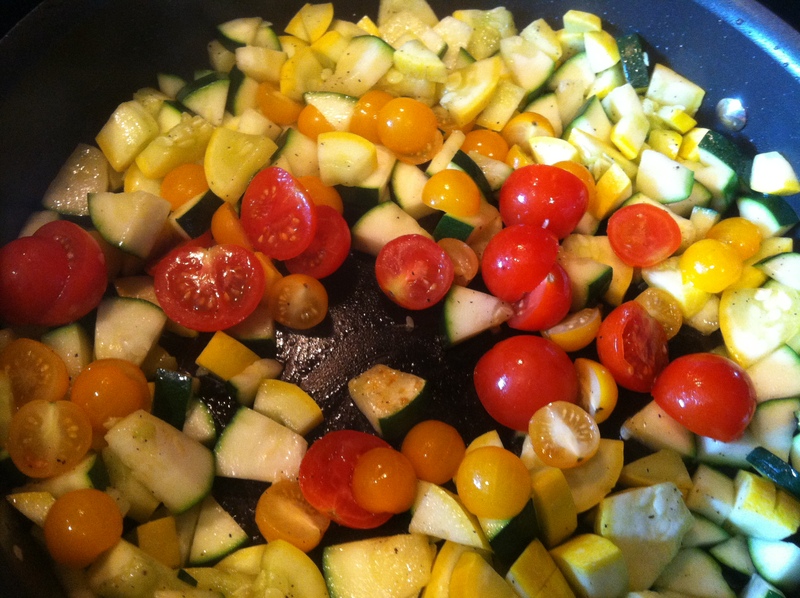 Once oil is hot, add zucchini and squash. Cook, stirring occasionally, for five minutes. Add tomatoes and cook an additional two minutes. Add spices and stir. Add wine and cook until liquid is reduced. Serve. ← Looks Like I Chose the Wrong Week to Quit…. You made me starving! 😦 Awesome post! Love it! I go to our local farmer’s market weekly and pick up a few things and make something like this often. Thanks! This looks great, and I’m currently in can/preserve/use everything already in the fridge mode as well! 2) Link back to the person/blog who nominated you. 4) List 15 bloggers that if you could nominate anyone for this award, name which blogs that would be and link to them. Let me know if you have any questions and Congratulations! Lovely color combination of color and flavor! 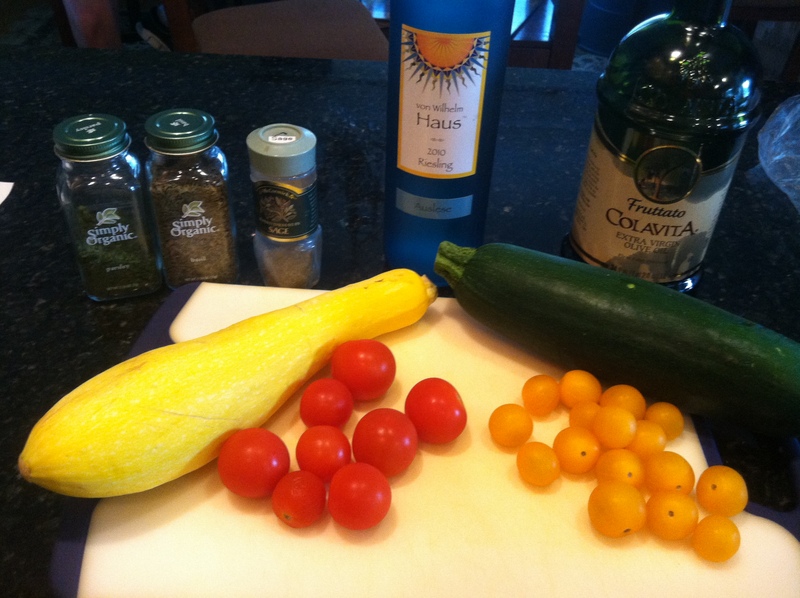 I use the 2 squashes often together, and look forward to adding the little tomatoes and a splash of wine! Thanks! 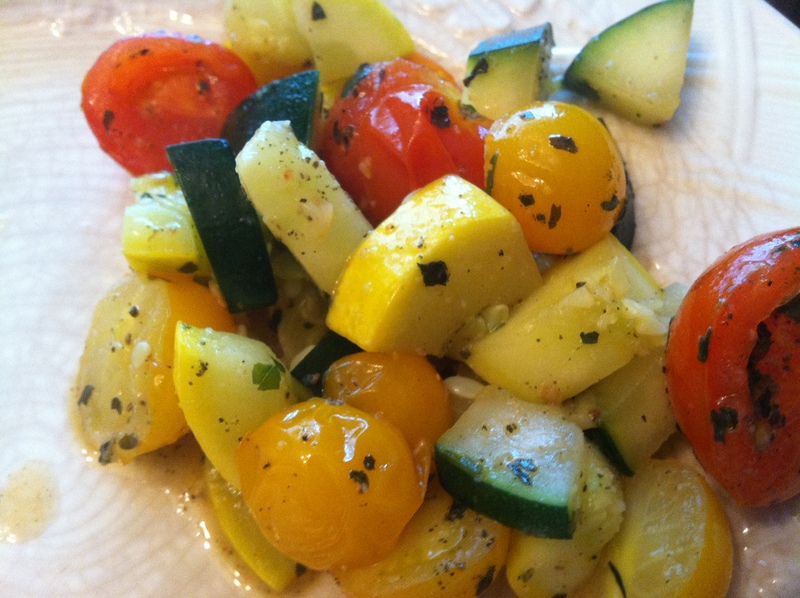 In past years this has been my go-to summer veggie recipe. When I’m feeling really lazy, I just sprinkle it with garlic-seasoning salt and italian herb blend. It’s so fast and easy–colorful, not to mention delicious. Thanks for reminding me. So fresh! Delicious AND healthy! Those biscuits on the other hand, not so healthy but oh sooo good. We are always roasting summer veggies in our house, but a sautee with white wine sounds lovely right about now. Looks great! 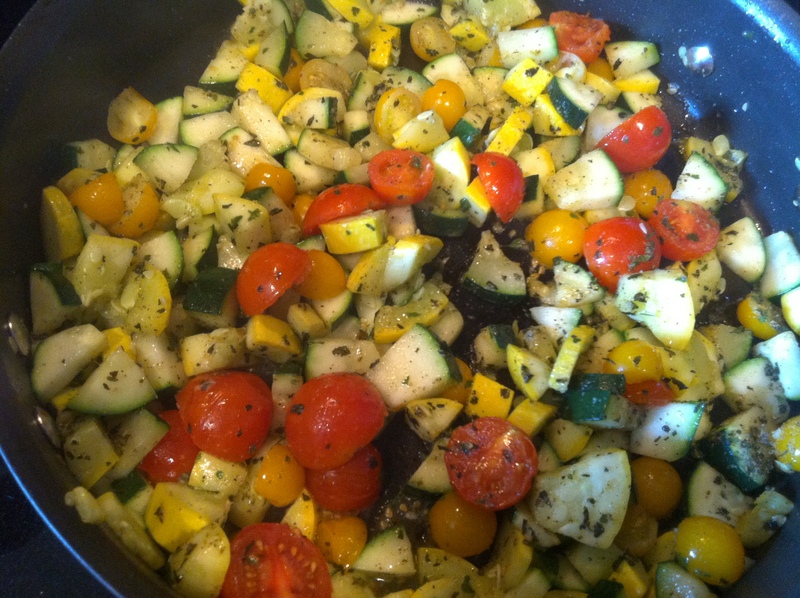 I just blogged a summer vegetables recipe with some chicken sausage mixed in… love the addition of the tomatoes in your veggie only dish, nicely done! Made this last night – squeezed a little lemon juice to brighten it, too! Delish! Thank you!